Gone are the days when a company was at the top of their game with a flashy new billboard, radio blip and catchy slogan on a newspaper ad. Advertising is now rooted in technology. Unfortunately, not all companies have staff members with the technical skills and training in online marketing to launch a successful campaign. That's why NetiCode is here to help you navigate the digital age. We have created a team of key players that harmoniously blend in-depth marketing knowledge with up-to-date web development skills to provide you with quality solutions that meet the digital needs of your business. We have managed the web presence and internet marketing for some of the most sucessful businesses. Let us navigate the complexities of online marketing, so you can focus on the things you love most. Digital marketing has taken decades of human observations and created a limitless interconnectivity that places the world literally at your fingertips. The multifaceted art of advertising has prismed into mobile usage, organic and paid web traffic, SEO, analytics and co-dependent strategies all neatly packaged in function and design. 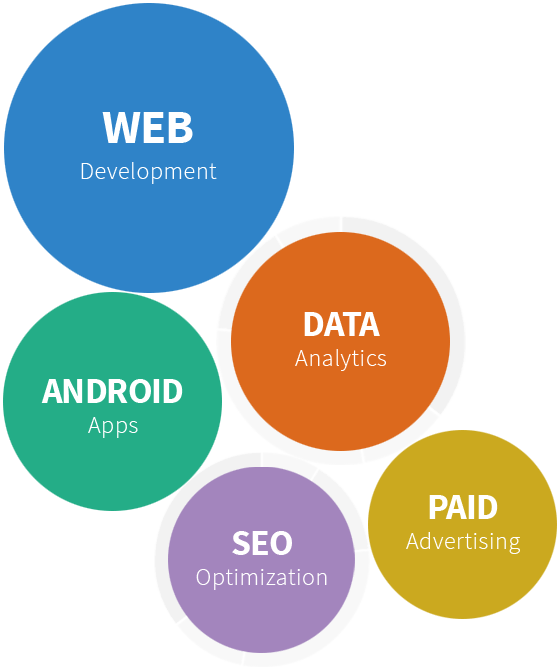 Our team of experts combines hands-on experience in digital marketing, web and app development as well as graphics and multimedia design to bring your business into the digital age. Working together makes your success, our story. Take a look at what we can do together. Net iCode Technologies Pvt. Ltd. Copyright © 2018 Net iCode Technologies Pvt. Ltd.